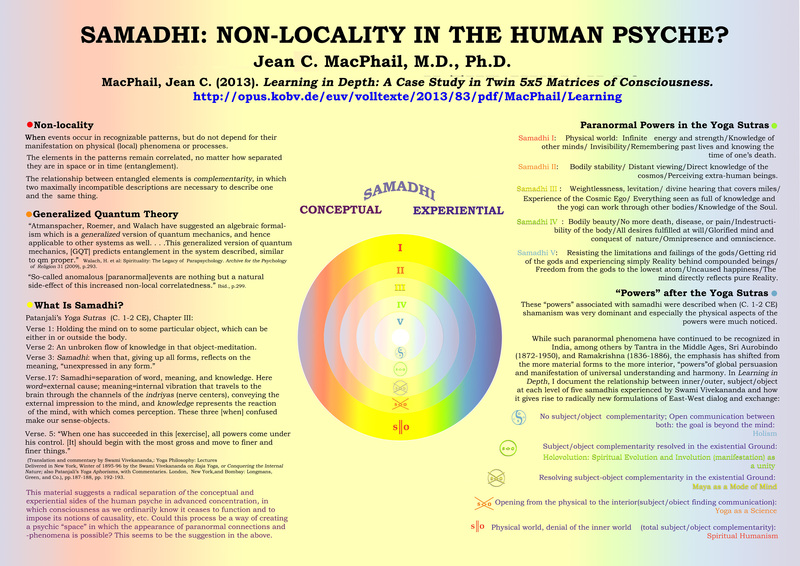 Samadhi—Non-locality in the Human Psyche?, by Pravrajika Gayatriprana, MD, Ph.D.
Samadhi—Non-locality in the Human Psyche? Helsinki, Finland, June 10, 2015. One of the great disagreements of our time is between mainstream Western scientists for whom only the physical world and its laws of cause and effect are valid and real, and those who follow a spiritual path and attest to deeper levels and states of consciousness in which materialistic laws of cause and effect are superseded and others appear and can be developed, more subtle and increasingly able to reconcile the complementarity or conflicting nature of how we ordinarily perceive inter-related events. In order to point to these deeper, more reconciling states, some Western psychologists focus on what is currently termed paranormal phenomena, such as clairvoyance, clairaudience, etc. which have been observed from ancient times up to the present. Because these phenomena do not obey the usual, material laws of cause and effect, they are said to be non-local. My poster documents (below) shows how the East Indian tradition has, for over two thousand years, recorded not only the occurrence of such phenomena, but also correlated them with various definitive stages in depths of consciousness (samadhis) that can be attained through systematic and rigorous yoga (self-transformative) practice which takes us beyond the usual entanglement of conceptual and experiential consciousness that we consider “normal”. We find that, depending on “where” the yogi is on the spectrum of consciousness, each of five different samadhis is related to “non-local” phenomena, some more “physical” in nature, and others more psychological, global and transcendental. In addition to the original text on this subject, I also include a glance at the work and “non-local” status of more contemporary Indians who are recognized as very advanced in yoga. Their “non-local powers” tend more to the transcendental and global than to the merely personal, a phenomenon that may be related to the increasingly global nature of contemporary culture and its needs for heightened and expanded consciousness to guide it. This millennial traditional data might help to direct further inquiry into paranormal phenomena and their relationship to the states of consciousness associated with them over time in the East Indian tradition.